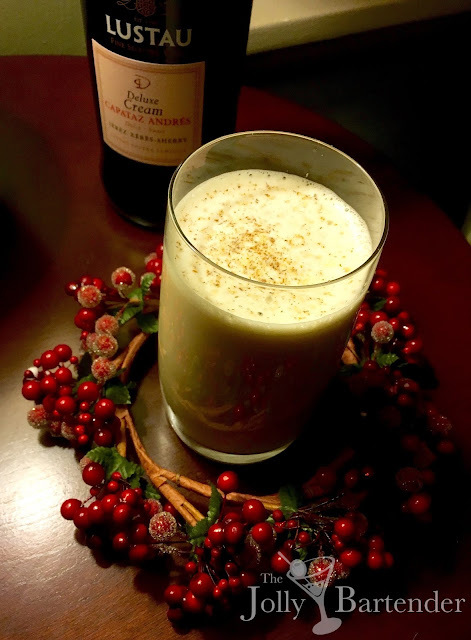 This is one of the mildest and probably most classic versions of Eggnog that you can make. Unlike distilled spirits Eggnogs that need cream and a lot of sugar to carry off the sweet thickness we expect from this holiday cocktail. Cream sherry, Lustau Capataz Andres in this case, is a dessert sherry that has a sugary thickness that tastes creamy. It is good enough of a substitute for cream in itself. And using it cuts down on the amount of sugar the drink needs because the proportion of sherry you can use to other ingredients is like fifty-percent more than if you used a distilled spirit like rum or brandy. Capataz Andres is a Lustau blend of Palomino and Pedro Ximenez grapes from Jerez. It is super creamy and sweet with notes of figs, prunes, walnuts and cinnamon and it really lasts long in the finish. It is dark and will color your Eggnog more than the darkest rum! Combine sherry, egg and sugar in a shaker with ice. Shake and strain into a chilled Collins glass and fill to the top with cold milk. Sprinkle nutmeg on top.